The Nigerian Chamber of Shipping (NCS) has harped on the need for the federal government to put in place a commercial regulator on port operations. The NCS has also advised the federal government to empower the Nigerian Shippers Council to act as the ombudsmen in port operations saying that the Nigerian Ports Authority (NPA) is saddled with too many responsibilities to content with. Addressing journalists under the aegis of Maritime Correspondents Organisation of Nigeria (MARCON),Director General of NCS, Ify Akerele pointed out that there is an aggressive need to put in place a commercial regulator to enhance efficiency in the Nigerian ports. She noted that the non passage of the ports and harbour bill has hampered maritime investment in the country. Akerele said that the NCS will support the NSC in ensuring that it gets the role of a commercial regulator adding that the chamber will contribute its quota to the national assembly in ensuring that the executive bill is passed into law. She reiterated that there is an aggressive need for an independent body outside the jurisdiction of the NPA to take control of economic and commercial regulator with a view to sanitizing port activities. The NCS boss affirmed that NPA is saddled with the responsibilities of the movement of ships on waters,technical operations of the ports and to monitor what goes on the waters including berthing arrangement of vessels at the Nigerian ports. The Director General affirmed that the absence of a commercial regulator in port operations is one of the burning issue that needs urgent attention by the president of the country to address. “I think what we are going to do now in conjunction with the Nigerian Shippers Council is to carry ourselves to the national assembly to make sure that the bill is passed into law for the shippers council to take control of regulating the ports”,she stressed. Akerele however appealed to the maritime media to support and champion the course for the shippers council to take on the ombudsman role in port operation . According to her, the banking and telecommunication sector of the economy have fared better due to the regulatory agencies put in place to monitor their operational activities. 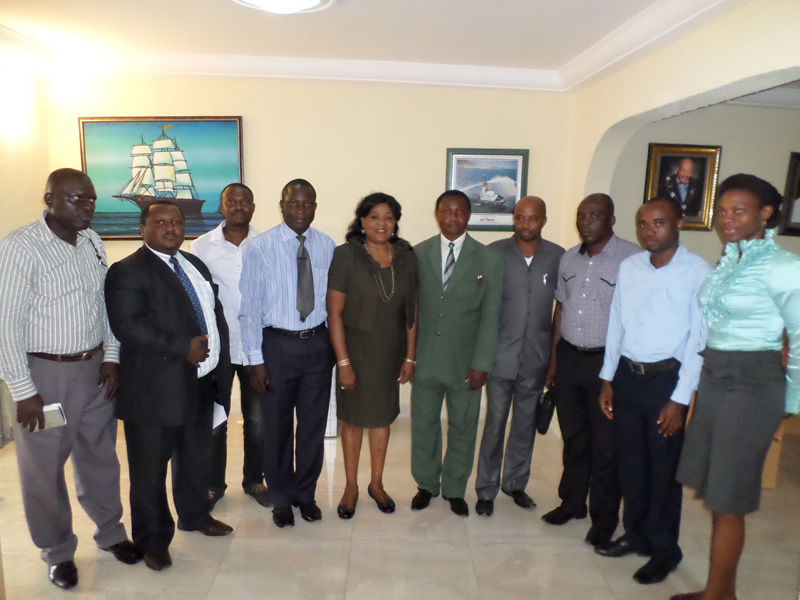 the executive and members of maritime correspondents’ organisation of nigeria (marcon) during a working/courtesy visit to the director general, nigerian chamber of shipping ify anazonwu-akerele on tuesday february 11, 2014 in lagos. 2nd left: General Manager NCS, Mr. Eronini Nnamdi C.
3rd left: Roland Ekama, Member MARCON. 1st right: barrister Susan Omezi of NCS.